Hi Az, Congratulations on you new channel. Not trying to be a wise guy or demean the above. My suspicion is it is another be happy forget your religion and all the nonsense that goes with it. Enjoy, smarten up, have a good time. It won't work for me, I fear plenty, for now, tomorrow, eternity. Between wars, pollution, all sorts of environmental problems,evil people, financial collapse, nuclear doomsday scenarios, my family's future. the list is endless, and then the more important ones come up like my status in the hereafter. Consider me afraid, paranoid, absolutely terrified, or perhaps just the plain old "Scared Shitless"
Thank you for the accolade ! Now let's have a look inside the engine room - the nucleus of the cell. Here we can see the familiar double helix shape DNA. how our moods, thoughts, beliefs, and general attitude literally mould our bodies. food you eat to the people you live with, is co-creating your body via your attitude. Epigenetics is the study of how the environment affects your genes. can you be a victim of fate. You can only be a victim of your attitude. You create the environment that programs your genes. This is the great secret that the Gene Keys hold - the secret of freedom. As you discover it for yourself, your life will be transformed before your very eyes. What edge am I supposed to Lose? Hello? I'm not the one who got "pissy" over some rocks. And your snarky response to the CANCER problem in Kingman (glowing green? ) proves you don't like to listen to the truth if it contains negative vibes. Are you into the "power" of positive thinking? Good luck with that. I prefer reality. Kingman is about 150 miles south of the Nevada Test Site. Residents would watch mushroom clouds from above-ground atomic tests rise above mountains to the north. KINGMAN – Danielle Stephens grew up on a cattle ranch here in the 1950s. She rode horses, spent her days in the sun and, like many people in the area, delighted in watching mushroom clouds spring up beyond the mountains. It was the middle of the Cold War, and about 150 miles north of Stephens’ ranch the federal government was engaged in a nuclear testing program. In Las Vegas and the tiny towns of northern Arizona, people were beguiled by the atomic explosions that lit up the sky. The Soviet Union had recently developed its first atomic weapon, and in response the United States ramped up its testing. Over 12 years, the U.S. performed 100 atmospheric tests at the Nevada Test Site. Today, Stephens and Bishop contend that radiation from the tests was the cause of cancer in dozens of their relatives and friends. At last count, 33 of their family members had died of cancer. 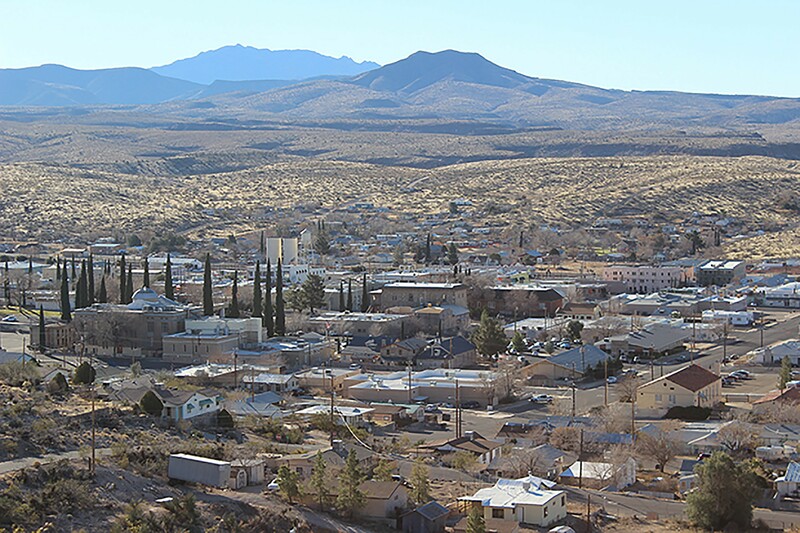 Despite data showing that Kingman, like the rest of the southern portion of Mohave County, was exposed to double the amount of radiation recorded in other Arizona counties, the health risks are yet to be acknowledged by the federal government. It’s been more than 50 years since the United States stopped above-ground testing in Nevada. Since then, the federal government developed a compensation program for “downwinders” in certain counties in the Southwest, including six in Arizona. Kingman residents, however, were not among them – and they say they don’t know why. With the people who witnessed the tests now 60 and older, they’re still seeing friends develop cancer and they’re still confused as to why they weren’t included in the program. They’re fighting for what they believe is their right to compensation. In the ’50s, Stephens and Bishop were out on a cattle drive when they were caught in the middle of an atomic wind. “There was five of us on horseback and Daddy says ‘Here comes that dust, you guys. Ride as fast as you can and get low,’” Stephens said. But it was too late. All five of them were dusted on their horses while out in the Cerbat Mountains. Three of them, including Bishop, later developed cancer. Bishop said he didn’t realize the potential dangers of radiation until he became a reserve deputy sheriff in 1957. Members of the military came to the sheriff’s department in Kingman and asked the officers to wear thermoluminescent dosimeters, small cylindrical containers, on their pocket lapels to test radiation levels. The dosimeters showed the military how much radiation each person received. That information was never communicated to the department or the individuals who wore the devices. A tiny town full of miners’ daughters and ranchers’ sons, Kingman didn’t seem to be a major concern for the Atomic Energy Commission. According to the U.S. Census Bureau, Kingman’s population was just over 4,500 in 1960. After the effects of radiation in Japan during World War II, the U.S. government sought to understand radiation health risks as one of its missions for the Nevada Test Site, said Allan Palmer, director of the National Atomic Testing Museum. In order to get a better understanding of radiation, the government placed animals, buildings and mannequins, donated by J.C. Penney’s and other department stores in Las Vegas, at different distances from ground zero during nuclear tests to evaluate the effects. But while officials were testing on dummies and sheep, they didn’t realize that the radiation was capable of traveling into Arizona and across the country, subjecting civilians to these tests. “When you look at the maps from the tests, if you lay them all together, it looks like the entire U.S. got some sort of fallout from the atmospheric testing,” said Darwin Morgan, spokesman for the U.S. Department of Energy, which now oversees the test site. Morgan said that even when health concerns were discovered, leaders were often overwhelmed by national security fears. One year in the late ’80s, Dan Bishop attended nine funerals. Aunts, uncles, cousins: all cancer deaths. When Bishop would show up at the cemetery, the mortician would tell him to grab the keys to the four-door sedan and take the pallbearers to the mortuary and cemetery. “That’s getting too frequent,” Bishop said. 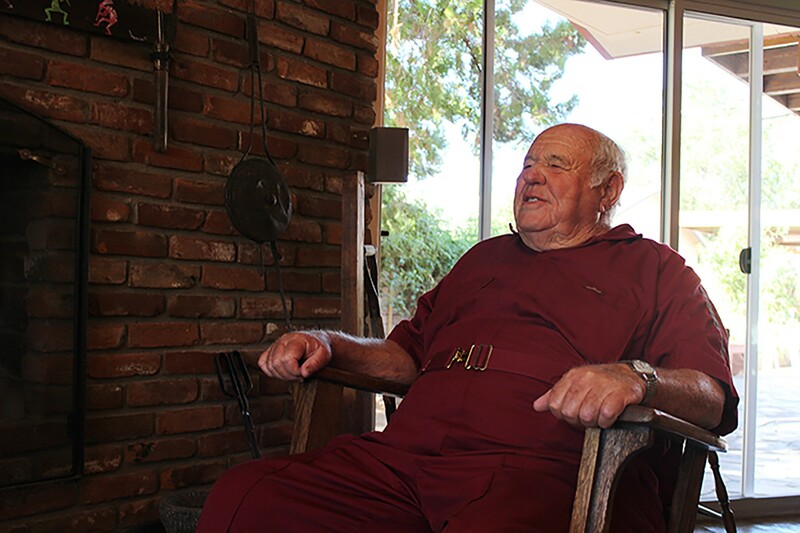 The town’s sheriff, Frank Porter, was one of the first to develop leukemia after the nuclear testing began. It was then that Eddie Pattillo, a native of Kingman, realized that the atomic blasts could actually be hurting them. Pattillo developed cancer of the urinary tract in 2000, at the same time his sister, Sharon Davis, developed a rare cancer that spread to multiple organs before eventually causing her death in 2007. When she was in school, teachers let Davis and her classmates run outside during recess and catch a glimpse of the mushroom clouds, Pattillo said. When she found out she had cancer, she was sure it was because of the radiation, he said. Studies of survivors of the atomic blasts in Japan and medical professionals with increased exposure to radiation show higher levels of leukemia and thyroid cancer in these groups, according to the American Cancer Society. But there’s also no proving if any given cancer was caused by radiation or any other number of causes. “Clearly for people who lived in areas where there was fallout, who were outside and watched these and who experienced seeing the dust particles come down and land on their skin, it’s pretty convincing for them that there is a direct correlation,” said Morgan with the U.S. Department of Energy. “There’s no way to prove that there was and there’s no way to prove that there wasn’t,” he said. In 1990, nearly 30 years after the last above-ground test was performed at the Nevada Test Site, Congress passed the Radiation Exposure Compensation Act, allowing people who developed certain cancers and lived in certain downwind counties during the testing to receive $50,000 from the federal government. Originally, the only part of Arizona included in the act was the sparsely populated Arizona Strip, the part of Mohave County north of the Colorado River. In 2000, the act was amended to add Apache, Navajo, Gila, Coconino and Yavapai counties. The southern portion of Mohave County, where Kingman is located, was never added. Laura Taylor, a Prescott lawyer who specializes in Radiation Exposure Compensation Act claims, said leaving Mohave County off the act was a political error. Until recently, Mohave County’s congressional representation was often based in the Phoenix metropolitan area, over three hours away. “I think there was just a lack of representation on the part of some politician,” Taylor said. In 2003, at the prompting of hundreds of Mohave County residents, former Gov. Janet Napolitano asked Arizona Radiation Regulatory Agency Director Aubrey Godwin to evaluate the radiation levels in each county. He found that certain levels of radiation were being compensated, while other, higher levels were not, including southern Mohave County. According to numbers compiled from the National Institute of Health and National Cancer Institute, residents of the southern portion of Mohave county had between 0.6-0.7 average rads per capita exposure to the thyroid. Gila and Yavapai counties, both of which are compensated under the Radiation Exposure Compensation Act, had 0.3. Godwin recommended that Congress set a baseline radiation level and compensate all U.S. counties that fall above that level. Danielle Stephens, who is now the president of the Mohave County Downwinders group, said she remembers seeing her father’s medical bills. Just one treatment was $37,000. In total, he racked up over $100,000 in medical bills before he died. Pattillo said his medical bill topped $190,000 by the time he was cancer-free. There are critics of the Mohave County Downwinders, many of them in Kingman, who say the group is looking to make a quick buck off of the government. But Stephens said that the people who say their efforts are just a money grab have never experienced $10,000 medical bills coming month after month. Since 2010, Reps. Trent Franks, R-Glendale, and Paul Gosar, R-Prescott, and Sen. John McCain, R-Ariz., have introduced bills that would include all of Mohave County in the compensation program. Gosar’s bill, introduced in 2013, was the only one to be heard in committee. It was then ruled out of order. Gosar said he’s not sure why none of the bills has moved forward. “We’re very frustrated in how to get compensation and have the fairness of RECA (the Radiation Exposure Compensation Act) being applied to the people that it’s responsible to, which would be all of Mohave County,” Gosar said. After meeting with congressional attorneys, Gosar was told the only way to get the whole of Mohave County included is to set a baseline radiation level and compensate all counties with radiation levels higher than that level. He’s planning to team with politicians in Clark County, where Las Vegas is located, in an attempt to gain more support for the issue. Gosar said he planned to introduce a bill in early 2015. Even if the bill passes the congressional attorneys legal tests, it still faces a difficult journey to win approval from Congress, Gosar said. Mohave County’s eligibility in the RECA program is a political issue. It’s a matter of writing a bill in the right way and persuading enough politicians to vote for it. It could happen next year, or it could never happen. To Dan Bishop, who said he has attended more than 30 funerals in Kingman, and Pattillo, who was diagnosed with colon cancer in October, cancer is far from political. Agelbert NOTE: Of course, if we are all going to die in three years or so, the above is a low priority for you. But if you keep hanging around there for a another couple of decades, don't blame me if you get CANCER for warning you about it. 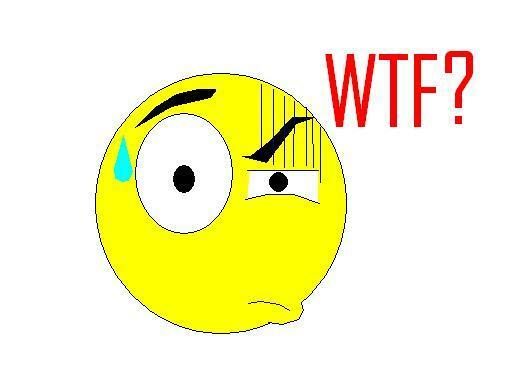 AZ, a suggestion; when u copy/paste text from a website, at the end following also copy/paste the www...... adress so people can find the original link and it credits the author. Very interesting re the DNA, some indian yogis have been saying that meditating at a high level affects your DNA making it more ordered, I respect those. "Lightbody" also says the awakening stages that happen individually or collectively are DNA driven, but I dont believe in Lightbody. Thanks for the advise on the copy / paste thing. However I'm not copy / pasting this book. I'm retyping it here. the material & a refresher brings it all back again. if you & your brother plan to visit the states. I'll give you guys the silver dollar tour if you'd like that. is where they are most comfortable. you to completely re-envision yourself and recreate your life at a level limited only by your imagination. just such a transmission. As archetypes they each contain a fractal aspect of the same universal Truth. As genetic archetypes they allow you to resonate that Truth deep within each cell of your body. ancient mystical arts and paths. refinement, this path too arrives at an enlightened view of the nature of reality. you play with it with your mind, your feelings and intuition. All of a sudden the treasure is revealed. activated through the patience and softness of the heart, and only later confirmed by the mind. determined to solve a riddle. If we're all going to hell gents, save me a place by the fire. I re-typing portions of the book entitled "Gene Keys" by Richard Rudd. words to describe that gene. Actually the medical community is adopting this book for Psychiatric research. rusty antique VW's & now this book the size of Denmark.